Amy Houlston at Burgess tells me that they have signed another new yacht for sale, the 40m Aqualibrium. Commissioned by a seasoned yacht owner, she was built by CRN in 1994 to exacting standards with a keen attention to detail ensuring that she provides the ultimate in comfort and relaxation. She features a voluminous interior designed by Walter Franchini which is elegantly adorned with exquisite marble, alabaster, and curved Italian wood panelling, while large, oversize windows allow for radiant natural lighting and spectacular ocean views. Lloyds +100A1 Class and MCA compliant, she can accommodate up to 10 guests in 5 staterooms. The master cabin is located forward on the main deck and includes his and hers bathrooms with panoramic views. The lower deck holds four luxuriously decorated guest staterooms including one full beam VIP cabin with an ensuite bathroom complete with Jacuzzi tub and shower, one double, and two twin cabins with ensuite shower rooms. One of the twin cabins comes equipped with retractable Pullman berths making it the perfect place to convert to an exercise room. 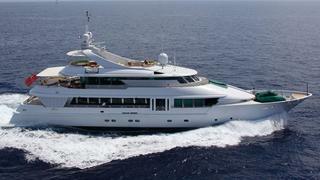 Aqualibrium is asking $7,450,000 and Amy goes on to say that the seller is extremely motivated and open to offers.